If you're looking to revamp your backyard some and make it a nice place to hangout, here are some garden designs to help you change things around. We are constantly looking for ways to help people improve their gardens. A healthy garden leads to a healthy life, and we believe that if you can learn to put sufficient effort into your hobbies and “for fun” activities, then you will be training yourself to handle those everyday tasks that seem dull and grueling more gracefully. Designing your garden so that it best suits your space and so it functions well for you may seem like a tough task to accomplish. Knowing where to start and what you are looking for can be the hardest part. That’s why we have put together these ten examples of garden ideas that have marvelous end results. 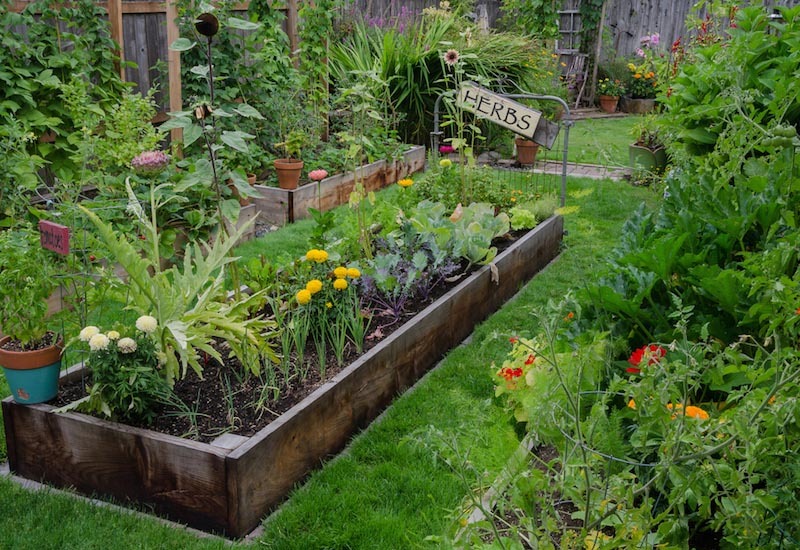 Whether you want to cultivate fields in your backyard, plant a whole vegetable garden, or simply have a small, peaceful space to escape your stress, there is something in here for everyone. Gardening can be a stress reliever in itself, so why not take one of these ideas and run with it? You may discover something about yourself that you never knew before. It’s important to remember that regardless of what you see other people create, you are the master of your own creativity. So you don’t need to look at these examples and think that every aspect has to be the same. If you see an idea that you like, start with your favorite part, and let your imagination work! Take a look at these ten examples and see if these ideas inspire you! The garden box is a great way to design your garden. 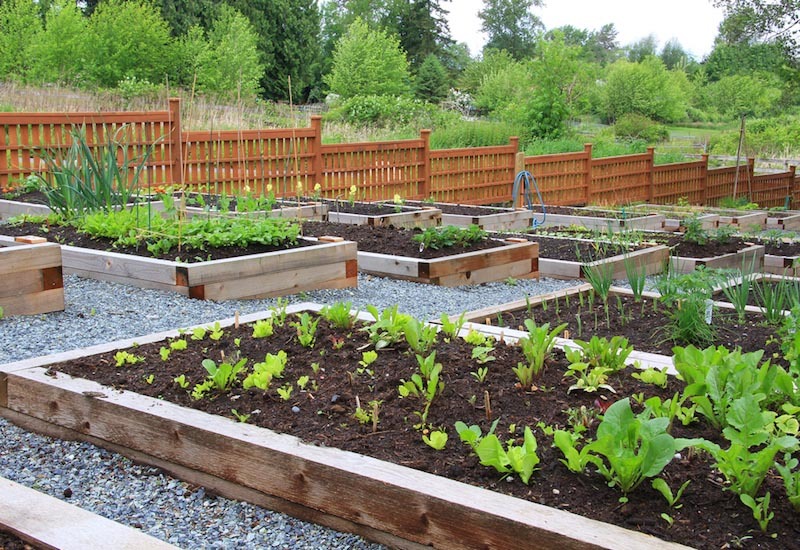 It allows you to arrange sections of garden instead of just being confined to one small space. Not only can you get a sophisticated look with an arrangement like this, you create a functional space for you to be able to get to all sides of your garden easily and tend to each plant as they deserve. An herb garden is a fantastic way to grow your own natural ingredients. If you like to cook, consider growing your own vegetables, herbs, and spices! It’s a great way to make yourself healthy meals without having to worry about too many processed foods. Not only is an herb garden like this functional, they are an aesthetically pleasing addition to your garden. What better way to appreciate your garden than to have a little seating space for you and a companion to enjoy right in the center of it all? 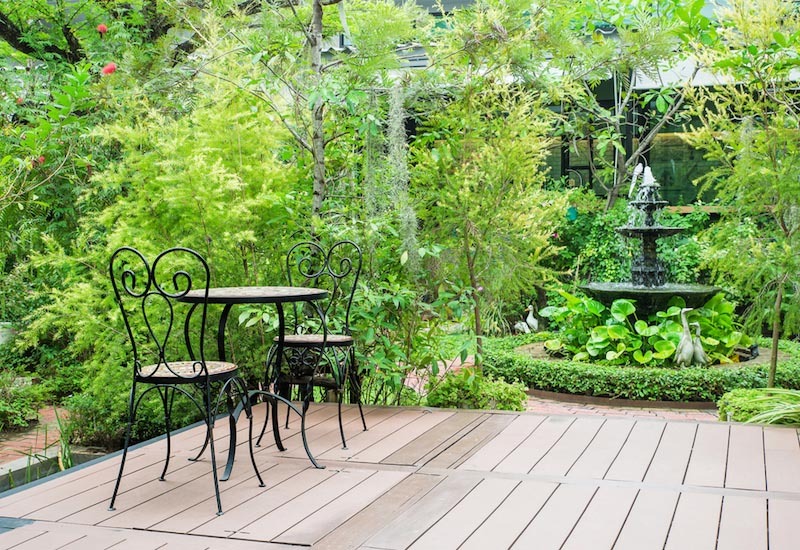 With a small deck like this, you can be surrounded by your garden but remain comfortable atop a stable platform. You will notice that this area even has a little man made creek running past, adding to the serenity of the space! This garden has been designed around a windowsill, making the space just inside the house a nice spot to sit and enjoy the garden from behind the window, while also framing the window gorgeously from the exterior. 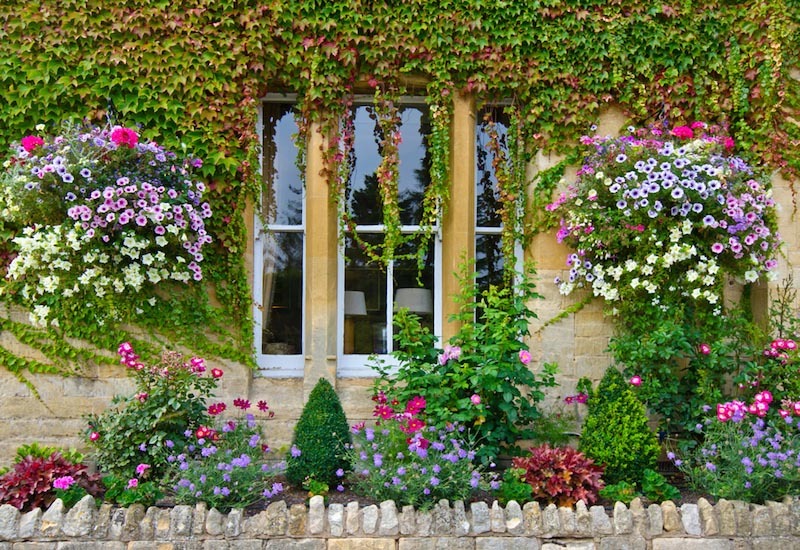 You will notice the gardener used vines clinging to the walls to frame the window, and placed smaller colorful flowers beneath the window, as not to crowd the space too much. 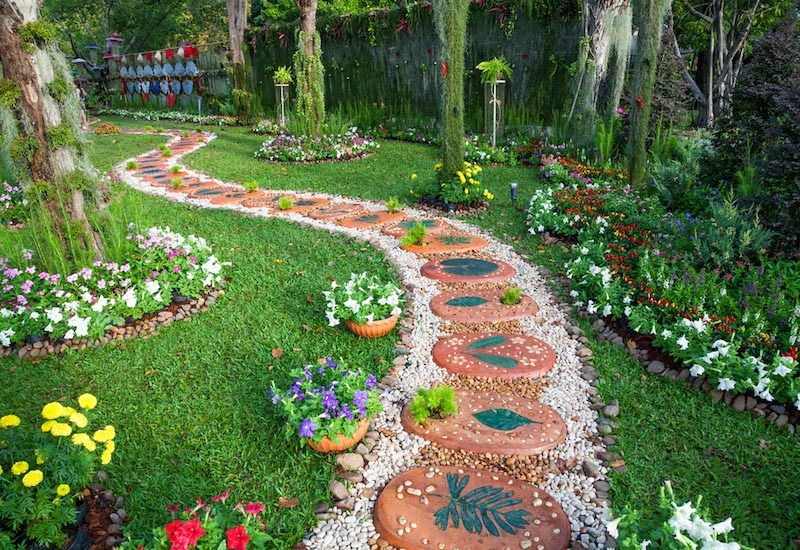 Having a stone walkway through your garden has a few different important benefits. One of which being that you are welcoming guests to follow the path and see where it leads. This will encourage others to enjoy your garden just as much as you do! Another benefit is that the path will dictate where people step, so you can avoid the accidental trampling of flowers. Just because you don’t have a huge backyard with access space certainly does not mean that you can’t have your own little garden oasis. 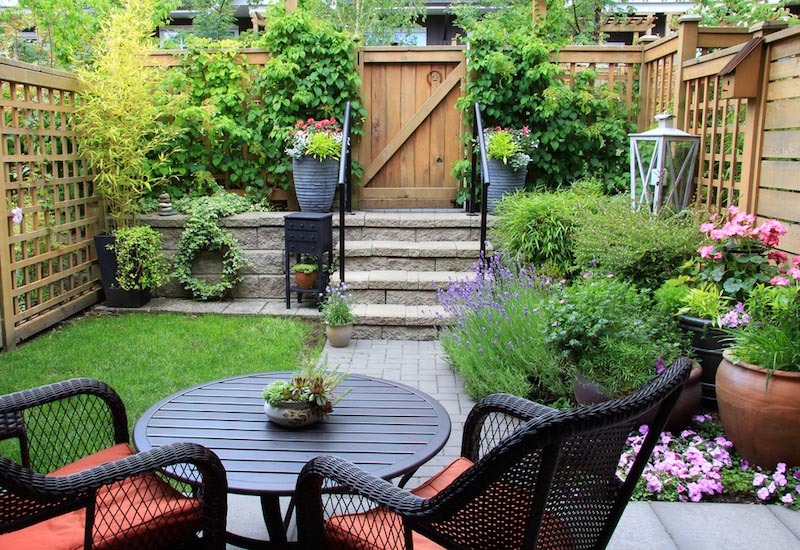 This townhouse garden is a fine example of how you can make the most of your small space. When confined to a small area like this, it is effective to create different levels, like the steps you can see here. This will help create the illusion that there is more room than there is in reality. 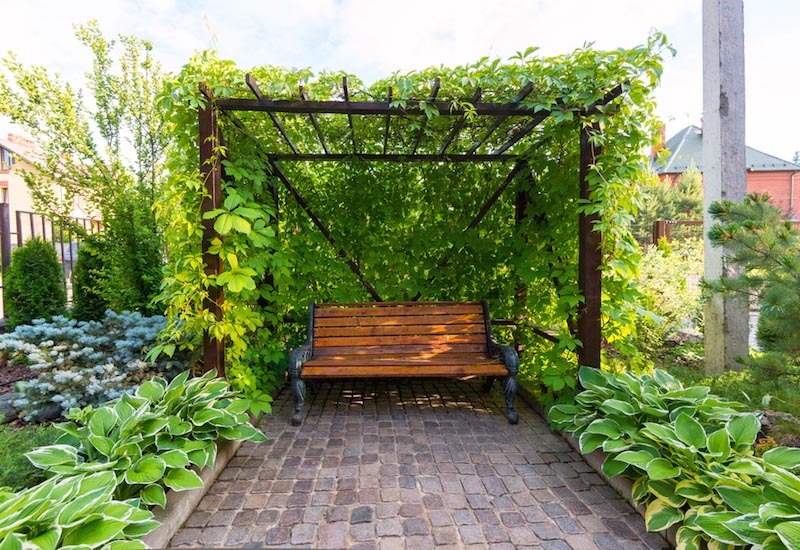 We can all appreciate a nice secluded space to sit and read a book or just escape the burdens of the outside world, and what better place to do that than in the heart of your garden, upon a wooden bench within an overgrown pergola? We can’t think of a place more peaceful. Do you have a large deck with an old eyesore railing? 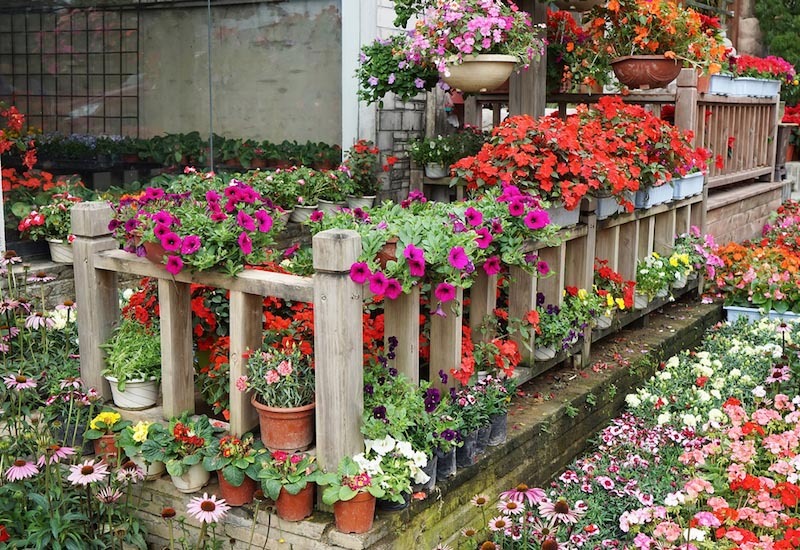 A great way to spruce up your space is to cover it with gorgeous flowers! It’s hard to go wrong when you have beautiful blooming flowers everywhere. Railings like the one pictured above actually create a pretty cool look when you place small potted flowers between each railing. This is a good way to create different “levels” for your garden. 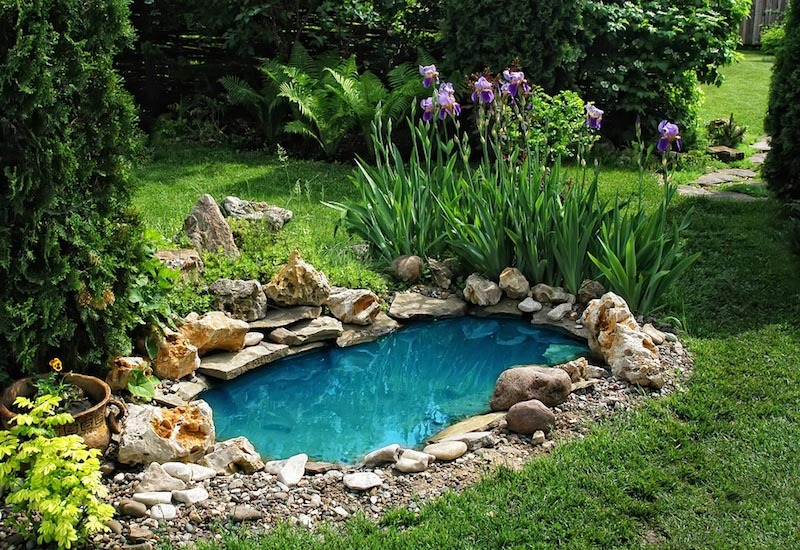 Rather than just leaving a gaping hole in your backyard, why not put in a little extra effort and turn that hole into a small pond for your garden? This is a feature that you don’t see in every garden, and if done right, it can be pretty impressive. They may take a little more effort to maintain, but sometimes the pay off of having such a unique garden feature is worth the extra work. 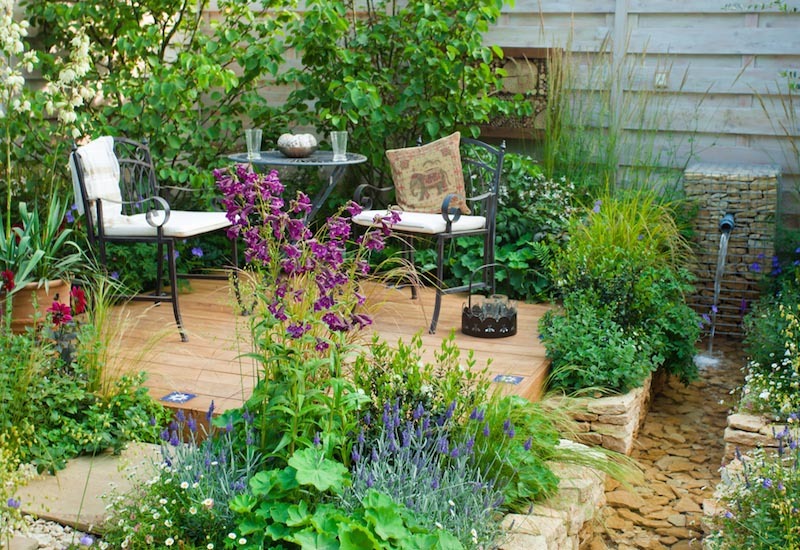 We have already talked about the benefits of having a small seating area in your garden. This provides a comfortable space where you can sit with a companion and enjoy the scenery. What we haven’t talked about is incorporating a fountain into that space. Not only will a fountain work well next to a garden’s seating space, it works wonderfully as a centerpiece and main attraction in a garden.